The Story of My Teeth (translated by Christina MacSweeney, review copy courtesy of Granta Books) is, for the most part, the story of Gustavo Sánchez Sánchez. Born into obscurity in Mexico, by all accounts an unattractive child, he rises from the position of Personnel Crisis Supervisor (he’s always handy in a tricky situation) to become a world-famous auctioneer. He’s a man who can sell anything, equipped with an array of intriguing methods to coax money from the wallets of unsuspecting buyers. While writing a book might be beyond him, his success in auctioneering eventually enables him to get some replacement dentures of his own, leaving him with a pile of loose teeth. What to do, what to do… Perhaps one last auction? 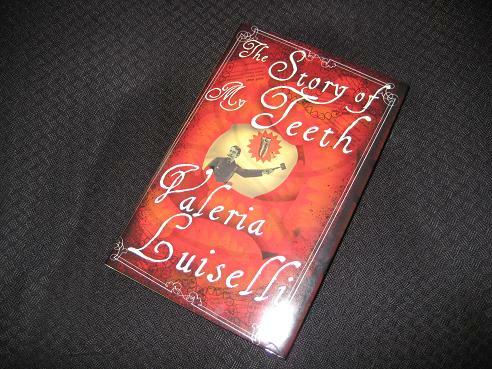 The Story of My Teeth is, to say the least, an interesting and ambitious book. Short, but fascinating, quirky and tongue-in-cheek, the madcap antics come as a surprise after the melancholy style of Faces in the Crowd. There’s a lot to enjoy here, in terms of both story and writing, but I do wonder whether Luiselli’s existing readership will come along for the ride. Quite… À la recherche du dent perdu, perhaps? It’s more a project, an art piece, than a novel (with photographs too). Even the translation, adding MacSweeney’s helpful ‘Chronologic’ (a timeline with the main events of the protagonist’s life and some explanation as to who the people randomly dropped into the text are), is a variation on the original. Also, the last chapter, written from a different viewpoint, helps to put the story into perspective, revealing that all is not quite as it seems. I liked her first novel but wasn’t quite as amazed by it as so many seemed to be – perhaps that means I’ll like this better! I’ve got a copy and plan to read it soon. Having loved Faces in the Crowd I’m curious to see how I’d find this one… I certainly like the premise & the shift from melancholy to mapcap… Still got Sidewalks to read first but will be watching out for this one. Great review. Poppy – Well, I’d definitely recommend reading ‘Sidewalks’ first (especially because, as mentioned above, I’m pretty sure it gets namechecked in this one! ).